This is a recent Vacuum Lifter we installed for Essexford Joinery. 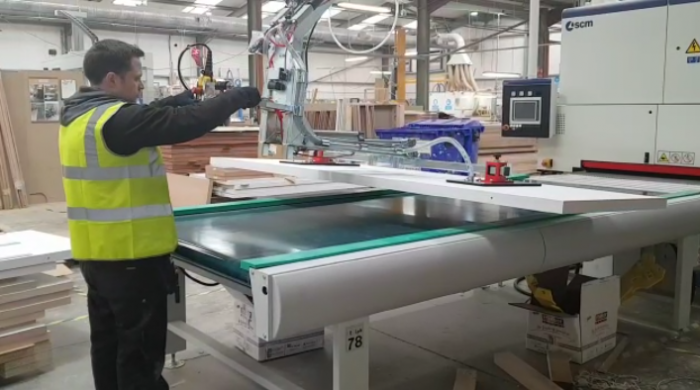 Essexford Joinery needed a solution which would reduce manual handling significantly for their operators without drastically slowing down their production time. Their aim was to have a lifter which would lift their doors from pallets onto sanding machines and vice versa while also rotating them to sand both sides. Bearing all this in mind we installed a Vacuum Lifter which is capable of lifting up to 100kg Doors on & off a sanding machine while also rotating them 180 degrees so both sides of the doors can be sanded. This Vacuum Lifter was supported by one of our floor mounted Jib Cranes with a 5m arm, the jib itself has a turning radius of 270 degrees which means our customer has an operating range of 10m that they can use the Vacuum Lifter for which covers multiple machines in their factory. Our Vacuum Lifter not only reduces the manual handling for the operator but it also speeds up the production. With Health and Safety in the workplace becoming more important everyday our Vacuum Lifters will make lifting these heavy doors a one man job while also eliminated any lifting, bending or carrying of these doors, it will also speed up production for the operator. We supply vacuum lifters for all purposes and industries throughout Ireland & Northern Ireland. Our Vacuum lifters can handle Drums, Sacks, Boxes, Reels, Boards, Doors, White Goods, Pallets, Steel, Glass, Stone and numerous other lifting requirements. All our equipment is supplied fully tested & certified thus been ready to go straight to work. We supply standard & non-standard equipment for that special application. We supply Materials Handling Solutions & Lifting Equipment to industries as wide ranging and diverse as Electronic, Computer, Packaging, Woodworking, Metal, Food, Drinks, Pharmaceutical. Literally all industries. Below is a video of our engineer David using the Vacuum Lifter to give you an idea of how it works. One Stop Handling Ireland Ltd.